Interracial dating is now pretty common. To a large extent, this is because of easy availability of high-quality interracial dating sites. Most interracial dating sites offer users both free as well as paid membership, with the latter coming with many additional features. Depending on your preference, you can join AfroRomance.com for free or by paying a subscription fee. Thanks to its large membership and a number of quality features, most users of this site are quickly able to take their dating life to the next level. Read on to know all you needed to know about AfroRomance.com. The sign-up process is easy and straightforward. Click the Join Free button on the homepage. On the next webpage, you would need to select your gender, ethnicity, whether you are looking for a man or woman, and the type of relationship you are looking for (that is, friends, penpal, long-term, or short-term). After you have filled these details, click the Join Now button. On the next page, you can choose how you want to login. You can join with your Facebook account. This is a faster login. AfroRomance does not post anything on your Facebook page. Or you can login using your email address and password. In the next screen, you would be asked to give need basic information about yourself, such as your date of birth, location, and a few lines to describe yourself. You would also be prompted to choose a nickname for yourself. Click the Finish button after you are through. You don’t have to pay anything for the basic membership; it is absolutely free. However, features available will be limited. To access the complete range of features, you would need to pay a subscription fee. AfroRomance offers 3 membership plans, 1 month, 3 months, and 6 months. You can pick any of the three as per your needs. VIP members enjoy many exclusive features. That’s why many people opt for a paid membership. Free members, as listed above, have access to only limited features. They can send other members a flirt, but cannot initiate a chat. As a free member, you can also go through the profiles of other members of the site, mark profiles as a favorite (but cannot view who all have favorited your profile), view photos of other members, and read profile write ups. Paid or VIP members can do all of this, plus many things more. They can send as well as receive unlimited email. As a VIP member, you can also start and receive voice chat and can check the names of members who have viewed your profile or have favorited your profile. It is a natural thing to want to chat with a member whom you like. Thanks to this feature, as a VIP member, you can do live online chatting with other members and get to know them better. This is another great feature. It in facts is one level above live instant messaging. Thanks to this feature, you can not only chat live with other members but also see them. With whom you have a better chance of forming a meaningful connection: someone whom you approach or someone who has shown interest in your profile? Obviously, the latter. This feature allows you to check who all have favorited you. If you like someone in this list, send him or her an invite and take things from there. When it comes to customer service, the customer care team at AfroRomance is as good as any. They respond to your query and concern quickly and efficiently. In case you want to ask something or need some guidance, you can contact the customer care team via email, phone, or fax. However, before you do that, you might want to check out the site’s FAQ section to see if the answer to your problem is listed there. The FAQ section of this site is quite exhaustive and detailed. You will find answers to all common questions in this section. 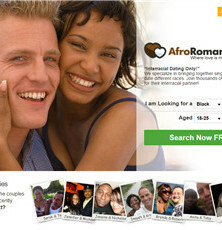 If you are interested in interracial dating, AfroRomance might be just the site for you. It has all the features to make online dating more successful and enjoyable. The site backs good features with high standards of customer care. Plus, the site’s intuitive interface makes navigating through the site easy. All in all, AfroRomance is a top-class interracial dating site. If you are not it, you are surely missing the best of online interracial dating.